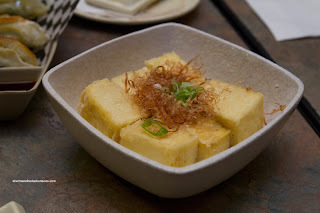 Milhouse, Emilicious and I decided to share some items starting with the Agedashi Tofu. This was pretty straightforward with lightly fried tofu which was soft on the inside. It was dressed ever-so-lightly with a mild tentsuyu broth. Nothing amazing, but solid nonetheless. Next was another bowl of Chirashi Don (yes, I seem to be ordering this a lot lately). It was a pretty substantial portion for the price featuring vibrant-looking sashimi (Atlantic & Sockeye Salmon, Tuna, Tako, Ebi, Amaebi, Tamago and Hokkigai) which was equally pleasing to eat. As for the sushi rice, it was chewy and nicely seasoned. 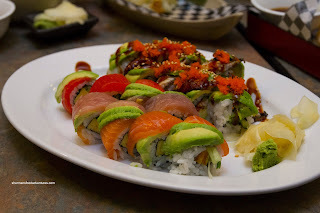 We decided to share a couple of specialty rolls including the Rainbow and the Double Dragon. As you can see in the picture, the rolls were full of ingredients and minimal rice. Moreover, the avocado was aesthetically-pleasing and ripe. 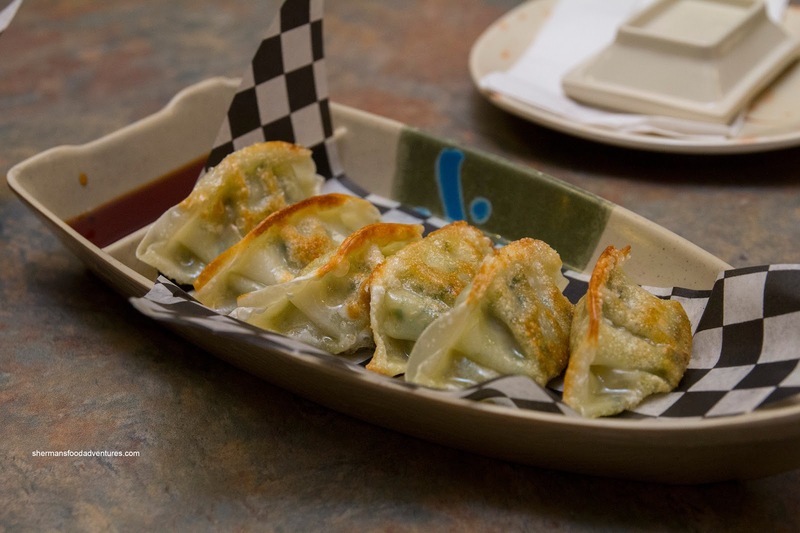 Onto some cooked food, we had the Gyoza, which were not very gyoza-like. There was quite a bit of greens combined with the ground pork. 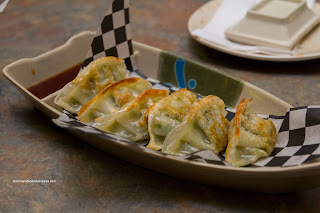 Hence, it was more like a Korean mandoo. Despite the visuals, it wasn't as crispy as the colour suggests. Lastly, as the picture clearly illustrates with the bright sheen, it was greasy. 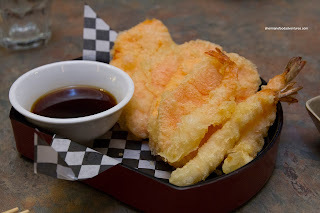 The last item we shared was the Yam and Prawn Tempura. It was "alright" as the batter was a bit dense, yet ultimately still crispy and not as heavy as it appeared. Yet, due to the amount of batter, it did affect the texture of the ebi. 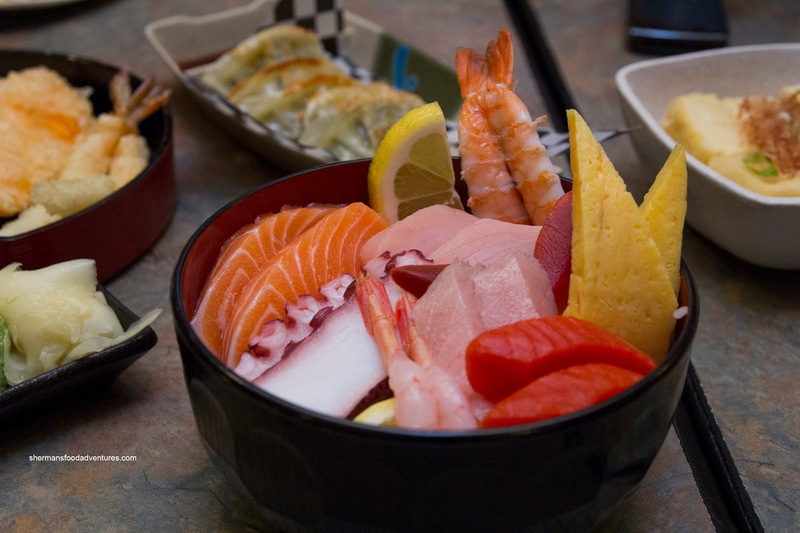 Lionel Hutz and Truditini ordered enough food for 4 people for themselves including an assortment of Nigiri (Tobiko, Unagi and Inari). They were neatly prepared with a good rice-to-ingredient ratio. Again, the decent sushi rice only added to the already good nigiri. 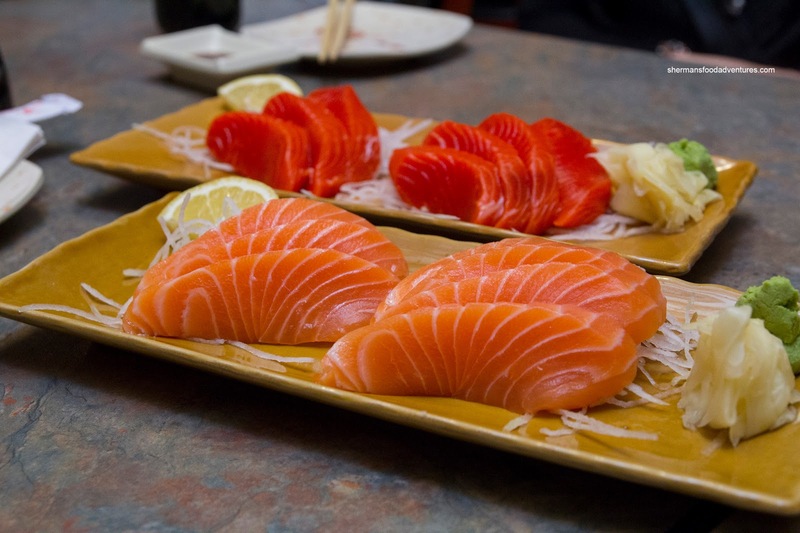 They went on to share a plate each of the Atlantic and Sockeye Salmon Sashimi (but I'm not going to talk about it much since we already had a Chirashi Don). The slices were large (yet not in an unmanageable size) and nicely textured. 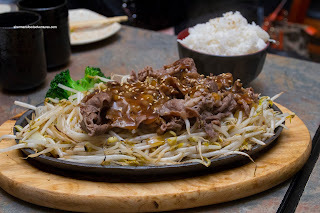 They also got a Beef Teriyaki. If you haven't already made the comment in your mind, the large amount of sprouts made the dish look funny. In fact, there was far too much of it compared to the beef. It was pretty tender though with a minimal amount of sauce. They also got Sushi Bay's version of the Awesome Roll consisting of imitation crab, avocado, cucumber with BBQ salmon, tobiko, bonito flakes and green onion on top drizzled with special sauce. 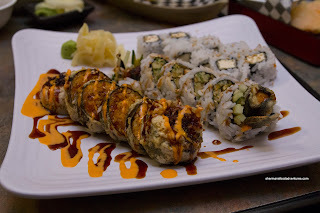 The roll was quite large and an excellent value for $6.95. Pretty standard stuff, but could've used more sauce. Another roll worth mentioning was the Hockey Pucks on Fire because we had just played a game. Ironic yes and also quite tasty. 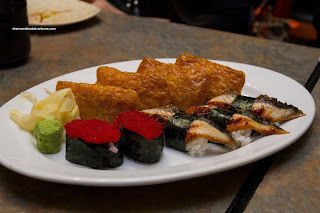 It contained spicy salmon and imitation crab wrapped in seaweed with no rice and deep fried. 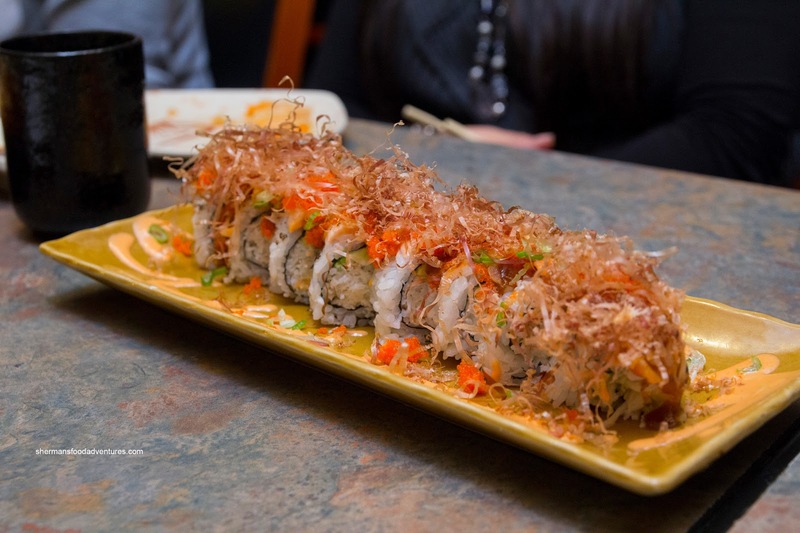 With the combination of sauces, the roll was zesty and crispy. After our meal, we all agreed that the value was definitely apparent with good portions at low prices. 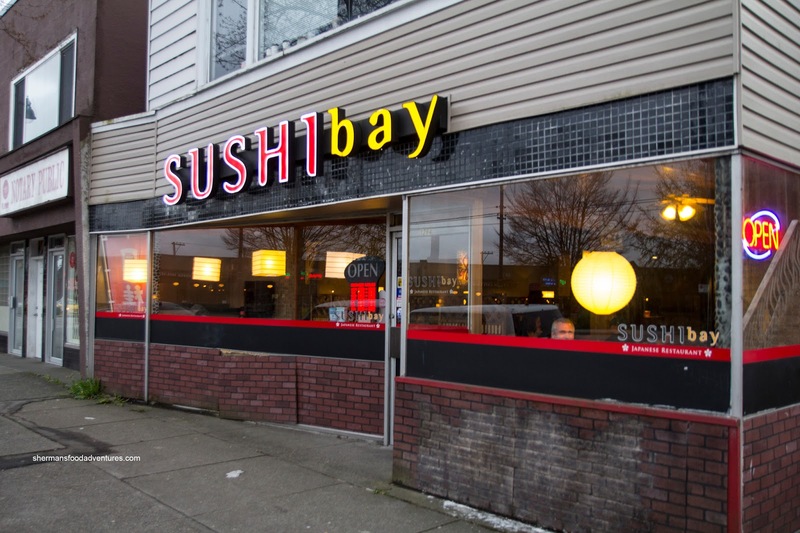 Sure, the stuff ain't completely authentic nor was it the best sushi we've ever had. But Sushi Bay is better in comparison to other similarly priced places. Ya, I had a very bad experience with service there. I lost my phone (and had spent $35.00 on myself alone) and they refused to let me use the phone. Even after pleading with them a couple of times and there was only me and one other person in the restaurant! Sillyness! Chicken karrage is decent though; tender and juicy inside with a lightly battered crisp outside.